Stampin' Up! has TWO cool specials going on right now! Just in time for your stamping, creating, wrapping, and giving, SU! has announced these great specials! 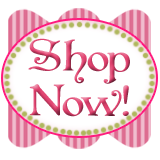 Contact me: carol@carolpaynestamps.com to order from the Pick a Pack of Pretty Papers Special (which expires this Friday Nov 30th!0 or the Wrapping Up the Holidays Special until December 15th! Here's a card we will be making at an upcoming hostess' stamp camp along with Boho Frosty from the previous post! 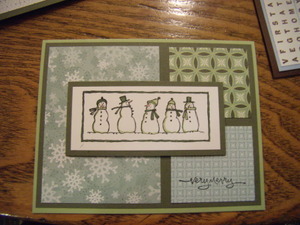 We will be making 4 cute cards at Robin Engelage's stamp camp in Coulterville on November 29th! 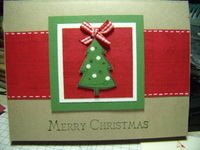 This card I CASED off the Stampin' Up! website. It's so great to be able to look up card ideas by the stamp set I want to use! We are using the Christmas Tree from the Year After Year Stamp set, along with both the Linen and Flannel Plaid backgrounds. Adding a little red gingham ribbon and faux stitching with the white gel pen finish it off nicely! November here in Southern Illinois has been awesome! The trees in Jefferson and Franklin Counties are just as beautiful as they were in October, although it's different trees. The maples are all gone, but the oaks are a beautiful orange and burgundy I've never seen before. They are like that everywhere, whether you go to Benton, Mt Vernon, or Bonnie! 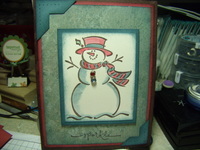 I CASED this Boho Frosty Card from my downline, Linda. She may have CASED it from somewhere else, but I have no idea where! Anyway, I had fun stamping this card with the Frosty set, Outlaw Designer paper (yes, that's Outlaw paper under the Blue Bayou Canvas stamped over it!) and blender pens with Ruby Red and Blue Bayou ink! Rhinestone Circle brad added just the right touch of bling! I CAN DO NOTHING WITHOUT TROY!!!!! My almost-25-year-old, single, blonde son, Troy, is helping me get my blog set up! He knows uber more than I do about web stuff, so I'm having him help me, practically doing it for me, but I seem to have so little time these days with all the workshops and camps I am doing, I need help! I love him!